Desquiciado was born of the long time friendship of Gonzalo Tamagnini and Martin Sesto. The two met while working with Alejandro Sejanovich and Jeff Mausbach on their various wine projects. They developed a passionate approach to all facets of the viticultural and winemaking process, becoming fanatics of the nuanced subtleties and complex nature of wine. They have found many unexpected challenges along the way, awakening a permanent desire for improvement, to innovate and experiment with new techniques. 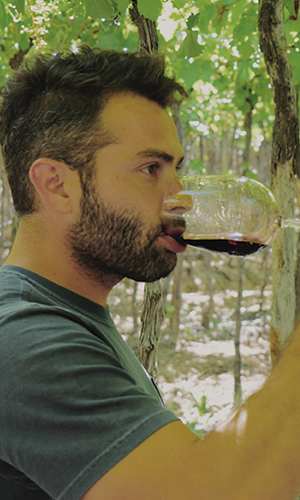 They have become so obsessed that they are now self proclaimed “Wine Maniacs - Desquiciados’. 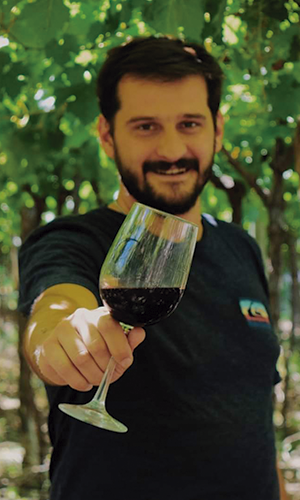 Gonzalo has been making wine for more than 10 years in the high altitude wine country of Mendoza. He has become obsessed with fine details of viticulture and winemaking – precise pruning, many harvest dates, and meticulous vinification. Martin has been working in the wine industry for many years. He developed his career in marketing, sales and logistics. He has been fortunate to work for several top wineries, learning a great deal about winemaking and viticulture, and nuturing a great appreciation for terroir driven wines. This Malbec was sourced from Gualtallary, Tupungato,in the heart of Uco Valley. The vineyard is 10 years old and produces a mere 2.5 tons per acre. The soil profile is shallow, rocky limestone with light silt. It has been elaborated with the traditional method in stainless steel tanks where the cold maceration prevails. When fermentation is over, 70% of the wine is aged in 3rd and 4th usage barrels for 9 months. The blend is made at the end with the 30% of the wine from the tanks, without wood, to give it strength to the fruit and gentleness to the palate. The grapes used for this wine come from Gualtallary, Tupungato, in the heart of Uco Valley, harvested from 5 years- old vineyards with a production of 50 to 60 quintals per hectare, with a sediment calcareous, not very deep and with a strong mud presence soil profile. Vinification is made in different bins with different methods. Many microvinifications are made by hand from the moment they enter the winery until the fermentation is over. The different bins are then blended in stainless steel and then 100% aged in barrels of 3rd and 4th used for 9 months. Our Pinot Gris is sourced from Gualtallary, Tupungato, in the heart of the Uco Valley, from a pergola trained vineyard. The fruit is harvested on two different dates in order to capture herbal notes on the first date and white stone fruit flavors not he second. The clusters were crushed and left to macerate with the skins for 3 hours in order to extract a bit of structure and lengthen the finish. The juice is then lightly racked and fermented with lees for 20 days at 12- 15 C°. There is no malolactic fermentation or oak aging in order to preserve the wine’s freshness and bright acidity. This wine is sourced from Gualtallary, Tupungato, in the heart of the Uco Valley. The Malbec is sourced from hillside vines on the edge of the vineyard. The soils profile is poor sandy, clay with excellente drainage. The Cabernet Franc comes from vines planted in a dry river bed, with very stony soil. The Merlot comes from a section in the vineyard with large boulders. Malbec was fermented alone and the Cabernet Franc was cofermented with the Merlot. The wine was aged in 2nd use French barrels for 14 months.